In terms of popularity, data science is proving to be an ever-growing career path. Data scientists are needed all around the world, for various different tasks and in various distinct companies. Professionals of this specialty are often considered as essential members of the team – their provided insight help the company understand both its advantages and its shortcomings, and to then provide a better and more optimized service to its customer base. With the interest in this career path on the constant growth, one of the main questions that people have relates to the data scientist salary – just what should a person, looking to study the subject, expect to receive as a stable data science salary? In this article, we are going to cover all of the different aspects of this question, and address them accordingly. 2 Skills Make a Difference! 3.1 How Much do Entry-Level Data Scientists Make? 3.2 How Much do Junior Data Scientists Make? 3.3 How Much do Senior Data Scientists Make? Data science is somewhat of an overarching term. A lot of people from different specialties can work as a data scientist, or at the very least perform some of the tasks of one. Furthermore, it would be impossible to talk about a potential data scientist salary that a person might receive before we actually figure out the different skill groups of this specialty. So, just to make sure that we’re both on the same page, let’s begin this tutorial by covering some of the main above-mentioned skill groups. Not everyone that wants to work in the field of data science and make a great data scientist salary has graduated from university with this specific degree. As I’ve mentioned in the beginning, there are a few other specialties that, once mastered and graduated from, would allow you to work in a data science-related field. Keeping that in mind, it only makes sense that people who are searching for a job as a data scientist often bring different strengths to the table. Some are better at organizing and segmenting the data, others – at determining the data sets and variables. That’s why quite a few different possibilities for a data scientist salary exist – this makes it somewhat difficult to extract a stable average. However, in this tutorial, we shall talk about and discuss only the three major skill groups that impact the data scientist salary – beginners (entry-level), junior and senior data scientists. I’ll briefly go over these three groups of people – this will give you a better understanding of just what defines each of the groups, and what data scientist salary you yourself can expect if you’re planning to choose this as your career path. Starting from the very top, we have the entry-level data scientists. This beginner group of people interested in data science is often overlooked when talking about the data scientist salary. However, entry-level data scientist salary is also a thing that impacts the average salary for this profession, so it’s equally important to discuss. An entry-level data scientist is, for example, someone who has just recently graduated from university and has started looking for work. These people tend to have absolutely no prior experience in the field (other than perhaps some practice work in the form of university assignments), and are looking for their first stable job. Needless to say that, when it comes to the question of a data scientist salary, these guys and gals earn the least. Their goals and focuses are (and should be!) concentrated on their learning and skill-practicing experiences. A lot of companies hire beginners and rookie data scientists and offer them company-based training and official preparations for the job. Surely, this means a lower data scientist salary, but that’s only normal when you’re just starting out. Junior data scientists are the group of people that can be considered as the “default” ones that people talk about whenever the topic of data scientist salary arises. They are the most common type of data scientists that you might encounter. These people already have some experience in the field. They are usually long-time workers in a single one company – this means that they’ve chosen their career paths and have started climbing up the ladder of both experience and data science salary. On the other hand, not all junior data scientists already have stable jobs – that’s not necessarily the key defining feature. They might be looking for odd jobs here and there (although, admittedly, it’s not that easy in this field of expertise). However, one thing’s for certain – they already know what they’re doing, and usually don’t need any sort of handholding. They are often referenced when people talk about the data scientist average salary. Seeing that they earn more than a data science entry-level salary, but less than a senior data scientist salary, this makes sense, right? Well, not necessarily. Thing is, the “junior” category of data scientists encompasses a very wide group of people. You could have “just entered” this group and are still learning the tropes, or you can already “be a veteran” and “on your way” to becoming a senior data scientist (I’m using quotation marks because these transitions are very arbitrary, and dependent on many different factors). Naturally, these two people would receive very different salaries, even though they technically belong to the same skill group. Finally, we have the senior data scientists – some of the most dedicated professionals in the field. Senior data scientists are people who have dedicated their lives to this profession. They usually work for the same company for many years, and are some of the essential personnel of the team. 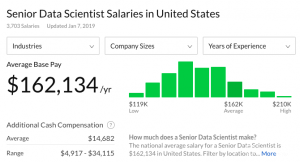 If the entry-level data scientist salary represents the lowest possible amounts of money that you can expect to earn when getting into the field of data science, a senior data scientist salary is one that you should be aiming for. These people earn the biggest amounts of money out of all of their colleagues of the same profession. Now that we have defined all of the main groups of data scientists, let’s finally move on to the main topic of this tutorial – the data science salary. I’ll tell you how much each of these groups of people make in the US, and then (for comparison’s sake) we’ll take a look at Europe. 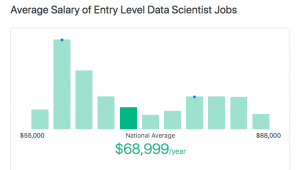 How Much do Entry-Level Data Scientists Make? As I’ve mentioned earlier, the entry-level data scientist salary is understandably the lowest out of all of the groups. But just how low are we talking about? Well, according to ZipRecruiter, the annual data science entry-level salary is estimated to be $69,000 USD. This means that a beginner data scientist makes $5750 USD every single month. Admittedly, we’re not talking low at all. If we keep in consideration that an average personal income of a worker in the US is somewhere in the range of $3500 USD, this number seems quite shocking. However, it does explain the continuously-rising interest in the field. Furthermore, it is a career path that requires a lot of dedication and studying, which leads to a higher-than-average salary. How Much do Junior Data Scientists Make? 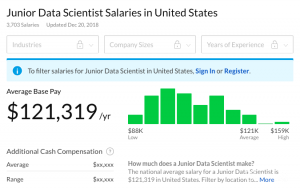 According to Glassdoor, a junior data scientist average salary should be somewhere in the realm of $121,000 USD, or over $10,000 USD every single month. Truth be told, these numbers do seem quite insane, especially when you compare them with the overall average salary in the US. 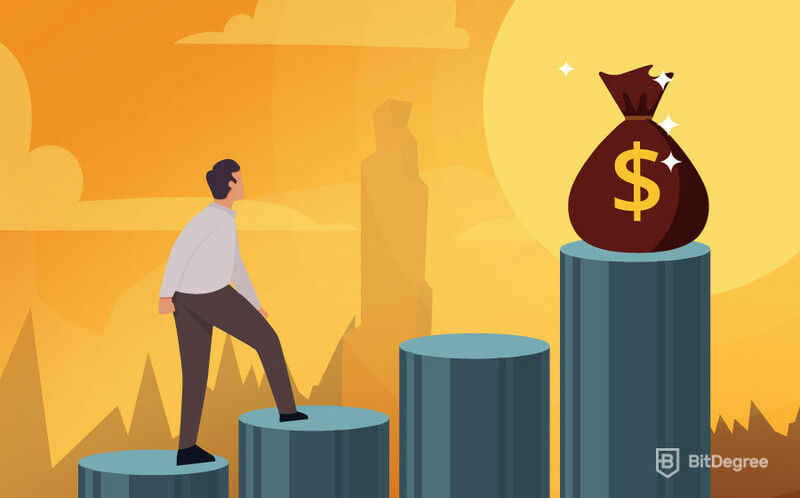 However, you should keep in mind that these numbers are relatively skewed – a junior data scientist can expect to earn both a bigger and a smaller data scientist salary – it all depends on the company, his or her skill level, amount of work, and so on. 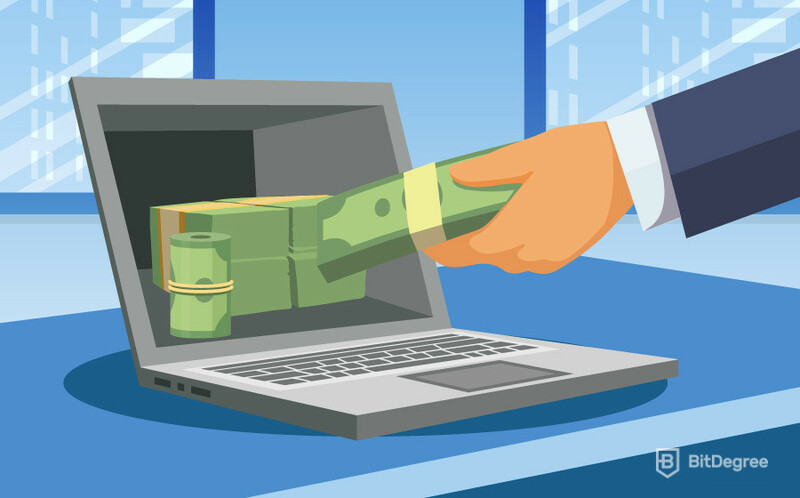 How Much do Senior Data Scientists Make? As I’ve stated earlier, the senior data scientist salary is (naturally) the highest of them all. But just how high can it go? Glassdoor states that a senior data scientist can expect to make around $162,000 USD annually, or $13,500 USD on a monthly basis. This number seems wapping, especially when compared to the entry-level data scientist salary (which is more than two times smaller!). However, to reach these sums, one would have to dedicate his entire life to learning, studying and perfecting his skills in the field of data science. Given this circumstance, the salary does seem to make a lot of sense. Now that we’ve covered the data scientist salary for all of the main different groups of data scientists in the US, let’s transition and travel all the way to Europe. We’ll take a look at just what data scientist average salary you can expect to earn in some of the European countries, and then compare it to the average data scientist salary in the US. According to DataCareer, the best European countries to work as a data scientist in (based on the salary alone) are Switzerland, Germany and the UK, respectively. 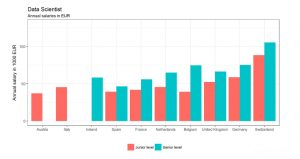 Both junior and senior data scientists can expect to earn the most amount of money in these countries (except perhaps for the senior data scientists in the UK – the country’s salary for this group of experts is in line with that of the Netherlands). Comparing Switzerland (as the highest data scientist salary paying country in Europe) with the US, some interesting conclusions can be drawn. Even though senior data scientists make over a $100,000 USD annually in both of these countries, a big difference can be spotted in both senior and junior groups. Senior and junior data scientists make a significantly larger income in the US when compared to Switzerland (and, in turn, other European countries). With all of the information provided above, you might think: sure, a data scientist salary is great, but is it still worth starting to study this specialty? And the answer that you would most commonly get would be YES. There’s actually a very simple reason for why data scientists are not only going to be needed for a long time to come, but also why the demand for such professionals might even continue to increase. As I’ve mentioned earlier, data scientists are usually regarded as essential members of the team. In a way, their research and provided insight dictate the pace and direction that the company takes. That’s why, with data scientists being some of the most important people to the success of any major company, the profession isn’t at all likely to experience a period when there wouldn’t be a demand for highly trained professionals in the field – at least not any time soon. At this point in the tutorial, you should have a pretty good idea of what are the different types of data scientists, and what salaries each of those types can expect to receive. Just to be sure that the information sticks, let’s have a quick recap. There are three main types of skill groups when it comes to data scientists – beginners (entry-level), junior and senior ones. Each of these groups have their own specific, distinguishing traits. By all means of the matter, a data scientist (no matter their skill level) makes a great salary when compared to the average income of a working-class citizen in the US. Even if we’re talking about the data science entry-level salary, it still climbs above the average mark. Data scientists have great salaries in Europe, too, but they fall short in comparison to those of US. Naturally, there are various different factors to consider when comparing the two regions, with the most prominent one being the average yearly income of each of the countries in question. All in all, data scientists are needed now as much as ever before – they identify trends and patterns, determine datasets, variables, help to communicate the information up the chain of command and do so much more! They are truly valuable assets to any successful team. Well, we have reached the end of our “Data Scientist Salary” tutorial. I hope the information was useful for you! If you yourself are trying to get a job as a data scientist, don’t give up! As you can probably tell from this article, the hustle is definitely worth the rewards!